The Kenmore Elite 79042 24.1 cu. ft. 2-Door Bottom-Freezer Fridge was designed to give you plenty of versatile storage space and to keep your foods fresher, longer. Stash snacks, tasty treats and delicious leftovers alongside fresh produce and household staples without worrying about keeping the fridge organized. A full-width pantry drawer is perfect for pies, pizzas and party trays while the adjustable glass shelves let you customize how you use the interior capacity of the fridge. Adjustable shelving door storage gives you plenty of food storage flexibility, even if you come home with way more groceries than you anticipated. Gallon storage bins and a Tilt-N-Store door bin accommodate wide and tall items with ease. No more puzzling out how to fit in milk, wine or juice next to the salad dressing and soda. Multi Air Flow technology works to keep cool fresh air flowing throughout the fridge while the humidity-controlled crisper drawers keep produce crisp and bright. Kenmore’s Multi Air Flow technology uses venting to help balance cool air throughout the whole fridge, even the door space. 2 humidity-controlled crisper drawers keep delicate produce fresher longer. No more wasting food. Keep pre-made meals at-the-ready and treats close at hand in this 2-tier pull-out bottom freezer. No more digging through piles of peas for a Friday night pizza. A built-in icemaker in the bottom freezer keeps fresh ice at your fingertips. Just reach in and grab a handful, whether you’re hosting cocktail hour or whipping up iced coffee for brunch. 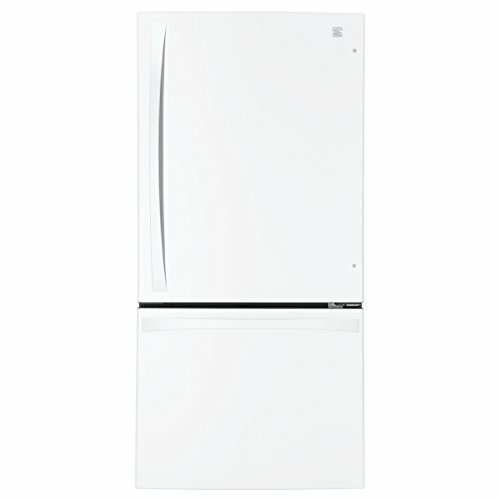 Keep more fresh food at your fingertips in this Kenmore Elite bottom freezer fridge.